In terms of performance and safety, motorcycle tyres are something that requires frequent attention. This guide explains how to check motorcycle tyres, what to look out for and how often. How Often Should You Check Motorcycle Tyres? It is advised that you check your motorcycle tyres general condition on a weekly basis and to check tyre pressures every two weeks. What Checks Should be Made on Motorcycle Tyres? Keeping your motorcycle tyres in good condition is not only a safety requirement, but a legal one too. For motorcycles over 50 cc, the legal tyre tread depth is no less than 1 mm around the entire circumference of the tyre and across the centre three quarters width of the tread pattern of the tyre. 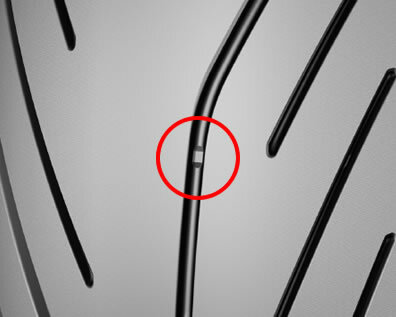 For motorcycles up to 50 cc the law requires that all the grooves of the original tread pattern must be clearly visible. Penalties for insufficient tread depth and/or poor general condition including incorrect pressures are often severe. A rider may face up to £2,500 fine and three penalty points per tyre. Tyre tread depth indicators – These are small raised areas located inside the tyre grooves. The height of these raised areas is set to the minimum legal limit of tread depth of 1 mm. When tyre wear gets close to these, it’s time to change your tyres. Not all tyres have these. Tyre tread depth gauge – These devices are easily operated and can be purchased online. Prices range from simple and cheap mechanical versions to more expensive digital varieties. Check the entire circumference of each tyre for unusual or uneven tyre wear as this can be a sign of incorrect pressure, a wheel balancing issue or a mechanical fault. If you are experiencing uneven tyre wear, first check pressures and if the tyre pressure is correct, check wheel balance. As the rubber based materials of tyres age, the properties change. Other factors can also dictate on how the condition of a tyre changes over time such as temperatures, tyre pressures and storage conditions. Many riders change their tyres regardless of condition after 5 years. If your tyres are in good condition after 5 years, it’s advisable to have them checked annually by a professional if you intend on keeping them. Regardless of condition, never ride on tyres older than 10 years. Check tyre pressures at least once every two weeks when the tyres are cold, using an accurate pressure gauge. You should keep tyres inflated to those recommended in the owner’s manual. Sometimes you may find this information on the swing-arm or hugger. Under inflated tyres will reduce stability while riding, it increases tyre wear and will also increase fuel consumption.